Pictured at a Teagasc reseeding demo on Padraig Melletts's farm Kiltimagh Road Balla, Padraig is a member of a Teagasc suckler discussion group and has been regularly reseeding a portion of his farm in recent years. 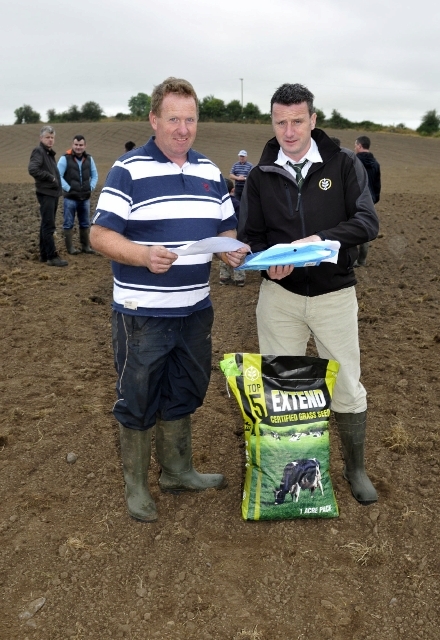 Padraig Mellett is checking growth data for the Top 5 Extend grass seed mixture with Dermot Campion, Germinal Seeds. Photo © Ken Wright Photography 2013. Pictured at a Teagasc reseeding demo on Padraig Melletts's farm Kiltimagh Road Balla, Padraig is a member of a Teagasc suckler discussion group and has been regularly reseeding a portion of his farm in recent years. 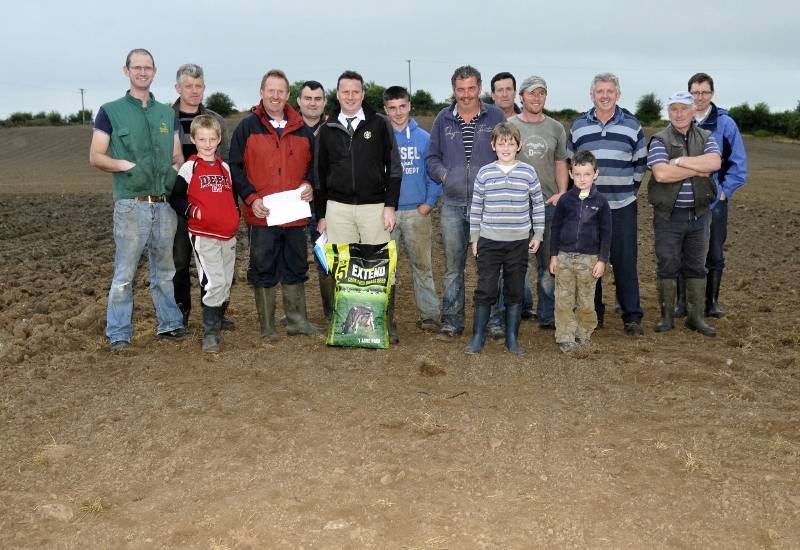 Padraig Mellett is discussing the improved Top 5 Extend grass seed mixture with Dermot Campion, Germinal Seeds also in the picture Padraig’s son Thomas, Alan Nolan, Teagasc and members of the Balla suckler group. Photo © Ken Wright Photography 2013. Top 5 Extend, the leading grass seed mixture from Germinal Seeds now includes an exciting new grass variety Aber®Gain. Aber®Gain has (i) exceptional total yield (ii) superb spring growth (iii) excellent digestibility (highest on Irish Dept. of Agriculture Recommended List for all three). This variety has been specifically bred to meet the needs of the Irish grassland farmer for early spring and late autumn growth. Top 5 Extend grass seeds mixture contains; Aber®Gain, Drumbo and Tyrella is available from all Co-op branches and Agri merchant stores.